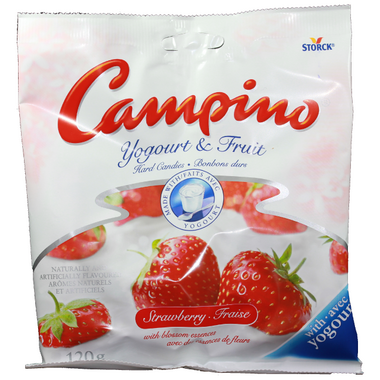 Campino candies combine the cool, fresh taste of real yogourt with the delicious flavour of sun ripened fruits to create a finely balanced indulgence! Ingredients: Glucose syrup, sugar, yogurt (22%), sorbitol, modified coconut and palm oil, lactic acid, sodium lactate, concentrated strawberry juices (0.6%)*, colour, natural and artificial flavours, paprika extract, soy lecithin, extracts (elder blossom, orange blossom, passion flower). Very unhappy with the fact that they contain sorbitol. Yes, they're very good in terms of taste, but I refuse to purchase anything with fake sugars such as manitol, xylitol, sorbitol, etc. Too bad, because they taste great. ****** delicious flavour ,all family liked. I have been looking for a hard candy that is not too sweet so when I saw these at Well.ca I decided to give them a try. Wow. was I surprised! They are dilicious, fruity and not too sweet. I will continue to order them. I have become somewhat addicted to these tasty delights. I always keep a bag in my computer desk drawer. My mother is loving them now as well. I love these candies. I am glad that Well.ca has them. I bought these candies for me and my sister and we both love them!